Mark has joined the Barnaba Autosport team in late August 2018 and brings an extensive automotive background with him. He has over 20 years of automotive experience spanning multiple manufacturers, over 15 of which has been with the Porsche marque. 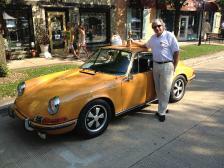 He is the former Service Director of Napleton Westmont Porsche. He is also ASE (Automotive Service Excellence) certified and is a member of AMI (Automotive Management Institute). Mark believes in two things: 1). You must have a passion for what you do and what you believe in and 2). Have an interest in order to be successful. Mark also believes that his success is solely based on the success of his clients. His passion is interacting with people and seeing them all the way through to re-delivery and his interest is the Porsche brand. He sees himself as a true Porsche enthusiast. Aside from Porsche, Mark enjoys spending time with his beautiful wife and his two wonderful children.